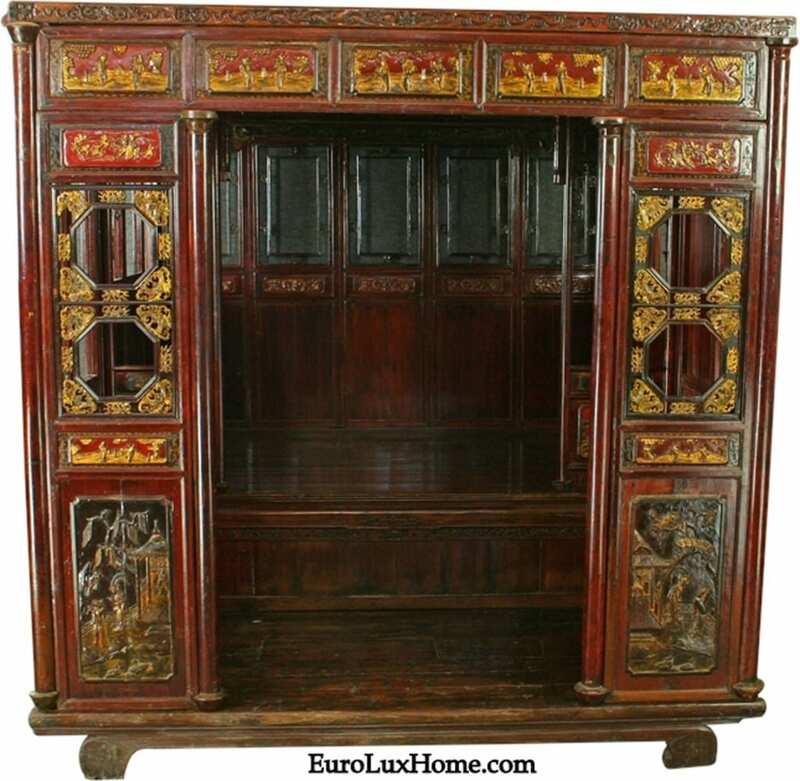 We imported this exquisite antique Chinese wedding bed to the USA in 2012…. it had previously inhabited a home schedule for demolition so it was wonderful to have the chance to give the Chinese wedding bed a new life! It was finally purchased by our customer Dongming in Greenville, SC, so it has landed in a place very different to its origins in the Zhejiang Province in Eastern China! Dongming and his daughter had driven to Columbia for the day and were on their way home to Greenville, when his daughter decided she really wanted to eat at Arby’s. They got off I-26 at Newberry, and while looking for Arby’s, they ended up on Main Street. Dongming decided he wanted to stop in some antiques shops, which is how he made his way to our EuroLux Home antiques store. He is a professor of Asian Studies, specializing in Chinese literature, so when he saw the antique Chinese wedding bed in our Gallery, he stopped in his tracks! He knew exactly what it was and also knew it would fit in his master bedroom. To top it all off, it was his birthday – so of course, he took it as a sign that it was fate and he was supposed to purchase the beautiful bed! The Late Qing Dynasty antique Chinese wedding bed in red lacquered pine dates to around 1900 and it is very ornamental and ornate. Antique Chinese wedding beds like this were once used by royalty, and were often called “Eight Step Beds.” It is divided into two areas, one for sleeping and the other for placing shoes and personal items as you get ready for bed. A Chinese wedding bed was actually used like an entire bedroom and Chinese women spent most of their time eating, embroidering, socializing, and sleeping in this area. Greg and I were out of town at the furniture market in North Carolina when Dongming purchased the bed, and we already had deliveries scheduled for the following week in Georgia. However, Dongming was leaving to take a group of students on a study abroad tour in China for the summer and he really wanted to have the bed delivered prior to his departure. I stayed up until 4 am the night before the delivery in order to get all 50 pieces of the bed cleaned, waxed, and ready to be delivered, but I made it happen! The bed comes apart in about 50 pieces and is completely held together with tenon and mortise joints – no hardware at all! 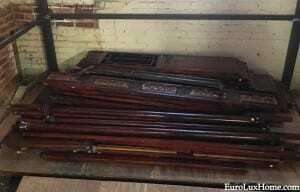 This is a photo of about half of the bed pieces. It took about two hours to reassemble it in Dongming’s home, but it looks great! The bed features various carvings of people and traditional Chinese symbols, gilded with a very fine layer of gold. Dongming is planning to use the Late Qing Dynasty bed on a daily basis, so this very beautiful bed will continue to be loved and cherished. 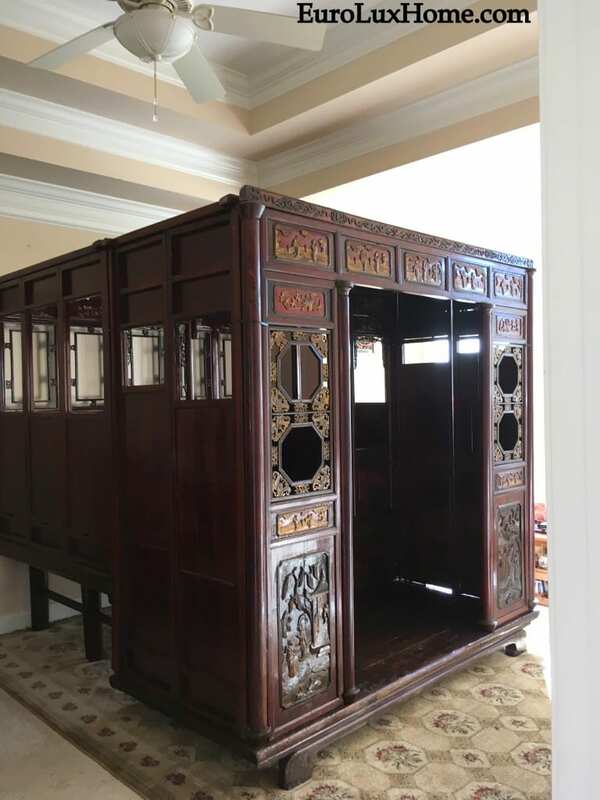 We’re so glad the superb antique Chinese wedding bed was saved and it found a new home! 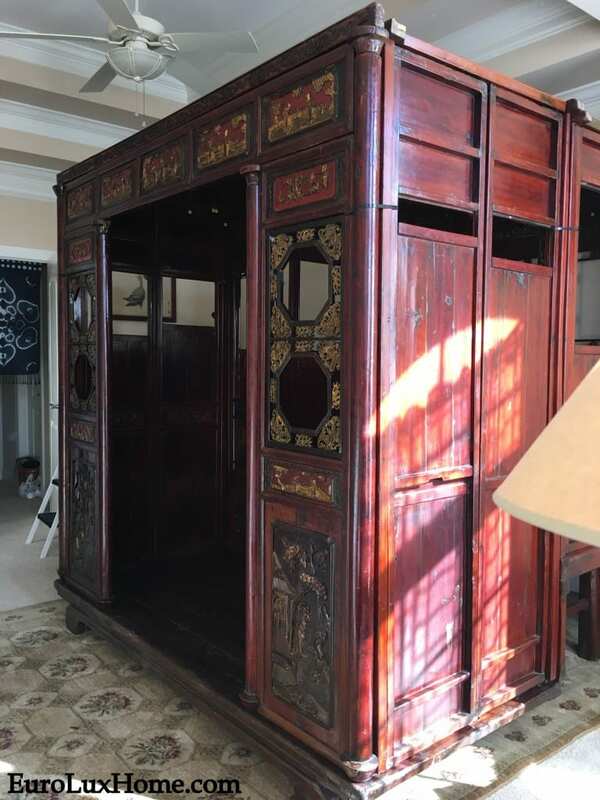 This entry was posted in Client Spotlight and tagged antique bed, Antique Furniture, bedroom furniture, Chinese Antique Furniture, Chinese Antiques, Chinese wedding bed, Late Qing Dynasty, living with antiques on May 9, 2018 by admin.